For all customers attending the Official after party at The Forum, University of Hertfordshire. The service operates FROM the festival between 22:00 (10:00pm) - 02:00 (2:00am) on Sunday 26th May - There are no daytime services. There is no need to book a travel time. Buses run continuously during these times - simply turn up and go. Please book online in advance to avoid the increased charges on the day. All customers returning into London will be dropped off on Islington High Street, outside the Angel tube station The service operates FROM the festival between 22:00 (10:00pm) - 02:00 (2:00am) on Sunday 26th May - There are no daytime services. There is no need to book a travel time. Buses run continuously during these times - simply turn up and go. Please book online in advance to avoid the increased charges on the day. Slam Dunk Festival offers a complimentary companion ticket for disabled customers (subject to availability). If you wish to attend one of the festival dates and require use of the accessible viewing areas (AVA's), a complimentary companion ticket or assistance please follow the instructions below. You will be asked to provide your DLA, PIP, benefits letter or equivalent, registered severely sight impaired card, assistance dog card or other evidence. Please note that all venues are wheelchair accessible and while we will do our utmost to cater for our disabled customers we cannot guarantee that accessible viewing areas will be available at all stages. Where they are present access will be subject to capacity. 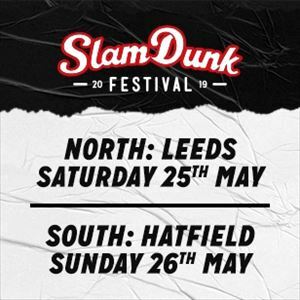 HATFIELD - Please book your ticket via See tickets or Lunatickets and then fill in the access form on slamdunkmusic.com in order to book your companion ticket. You will receive email confirmation of your successful application when we have processed your form. You will then receive full instructions of where to collect your companion tickets closer to the event date. tickets can be purchased with our instalment plan. All tickets are subject to Slam Dunk Festival terms and conditions.